I had the best of intentions. My plan was to do an article today that incorporated the Jock Scott wet fly and full dress salmon fly, similar to the one I did recently on the Silver Doctor. However, after working diligently on the full dress fly each night this week I've decided I just don't like it. These things happen, it just didn't pan out. So we'll have to make do with just the wet fly for now. I've had some interest in how these flies go together, so I'm thinking of showing a step-by-step pictorial of the creation of a Jock Scott next week. The full dress fly incorporates most of the techniques you'll run across with these, and if you can do a Jock Scott, you'll be able to tackle most others. 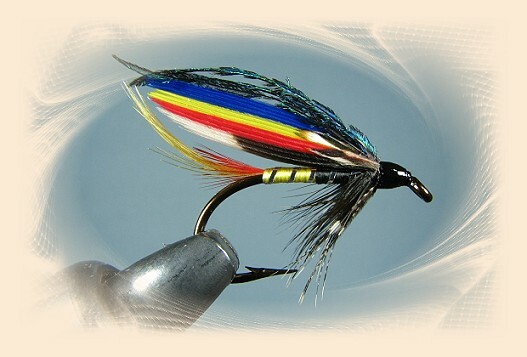 The fly above is taken from Ray Bergman's Trout, and is I think a fairly good representation of the big fly. The two tone body has been replicated, and even the Indian Crow feather in the tail is suggested. The Jock Scott is considered to be the King of the salmon flies, and over time versions of every sort have been done, from streamers to bucktails to wet flies. Like the Silver Doctor, it made the trip across the pond very successfully, and has been a mainstay for salmon in Canada and elsewhere. In the book Fly Patterns of British Columbia it is mentioned on several pages, and even places second to Bill Nation's fly, the Nation Special, in Kamloops trout caught on Paul Lake. This is remarkable, considering the Jock Scott was designed for salmon on the Tweed in the British Isles, and Bill Nation's fly was created by the famous guide from Paul Lake, specifically for Paul Lake trout. Eric lives in Delaware, Ohio and fishes for brown trout in the Mad River, a beautiful spring creek. 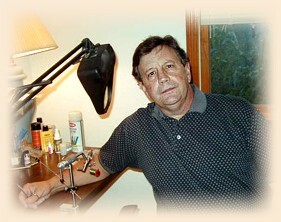 More of his flies are on display here: Traditionalflies.com -- Classic salmon and trout flies of Europe and the Americas.